During the Summer of 1989 I was in the U.S. Army stationed in Hanau, Germany. I was among 102 soldiers to compete in the Soldier of Military Excellence (SOMEX) Competition. I was one of only 22 finishers. As a reward, my company commander granted my teammates and I a temporary duty assignment known as permissive TDY. He re-assigned us to Garmisch-Partenkirchen, Germany for one week. Garmisch is a Bavarian alps ski resort town on the German-Austrian border. We partied, repelled, went white water rafting, and saw various sights. 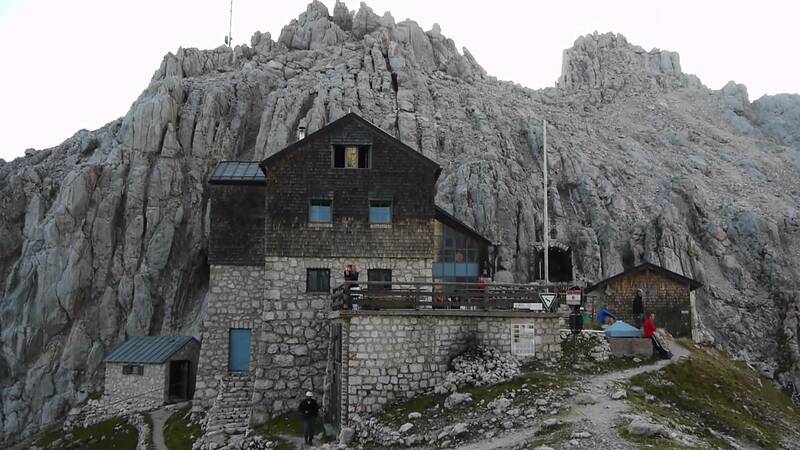 Yet the highlight was a climb to the Meiler-Hutte, a mountain hut, in the Wetterstein mountain range. The Meiler-Hutte sits on the German-Austrian border. I wrote the story below in 1993 while in college. It is my memory of the climb. The rocky trail is worn from the many adventurers that have traveled this way over the centuries. The land is green with grass. I can smell the fresh evergreen trees and patches of multi-colored wild flowers throughout. I see patches of snow and bare rock higher. The clouds are not far above our heads. It isn’t raining, but wet so near the clouds. I pull out my blue rain jacket to break the chill and shield myself from the wet air. White smoke streams from the chimney of the hut ahead. The hut’s white exterior contrasts the green vegetation surrounding it. The wooden antique-brown shutters cover the small windows. Two black and white cows are tied next to the hut. I hear the grinding of teeth and smacking of their lips as they eat. I approach the front door to the sound of laughter and of German conversation. The whistle of the wind across the mountain covers all other sounds. Outside the door are a wide variety of boots. As is the custom, I take off mine before entering. The room gets very quiet and then greetings are exchanged. “Guten Tag,” they say. I reply with the same, which means good day. Our German guides, Franz and Siegal, continue the conversation. As far as I can tell they are just making small talk. With broken German I order a cold soda and it quenches my thirst from the morning hike. After resting, we continue on our way. The hut gets smaller with every slow step up the mountain. I am fit, but the air is thin and I’m tiring easily. A large river becomes a tiny blue line far below. The trees blend together to make a carpet of green covering the earth. Some clouds are below us now. I feel as though maybe I can fly. I look off into the distance and think of my home so many miles away. I know that nothing obstructs my view of the United States but the curvature of the earth and the limitation of my own vision. As I come around the side of the mountain I can see three small huts and a large lodge. They interrupt the beauty of the mountain, but after four hours of hiking I’m glad to have another place to rest for a bit. Grazing near the huts are cows and a few sheep. The land here is flat. The vegetation is becoming sparse, but the air is pure. Our guides explain that the lodge is Königshaus am Schachen (King’s House at Schachen) and was built 1869 to 1872. It was the Summer hunting lodge of “The Mad King”, King Ludwig II who died in 1886 at the age of 40. After resting, we continue up the mountain. The trail weaves between boulders, rounded, rough, and laying like dead elephants. The trail becomes steeper, extracting more energy from my body. My legs are sore and ache with every step I take. My boots have soles of concrete and my gear seems to weigh twice what it did when I started out. I think, “I can not let this mountain beat me.” The air gets thinner and colder as I ascend the rocky beast. There are patches of snow scattered about. Far below I can see King Ludwig’s lodge and the brown zig-zagging trails that lead to it. Puffy white clouds with the texture of cotton float below me now. Mountain ranges continue for as far as I can see. The view is breathtaking. I think, “Heaven must not be far from here.” I come upon a large wooden cross standing beside the trail. Now I am sure that I am close to heaven. The cross is old and weathered but it stands strong against the harsh environment. It stands as a sign that other people have made it this far. While resting at the cross I notice an empty water bottle in my backpack has collapsed. This is evidence of the high altitude and how much stronger the air pressure is here. I loosen the lid and with a rush of air and a thud, the bottle returns to its normal shape. A jet-black crow with a sun-yellow beak lands about five feet from me. He seems to be excited; he doesn’t receive many visitors here. I throw him a piece of bread and he eats it. My feathered friend stays and investigates me a little longer. He then flies off into the blue sky. We are close to the top of the mountain now. This will be our last break before reaching Meiler-Hutte for the night. I am anxious to finish. We get back on the trail. Nothing is growing here. There is only gravel and boulders. In the distance to the right I can see a herd of dirty white mountain goats. They give me a quick glance and then continue about their business. I look up at Meiler-Hutte and realize that the last three hundred yards is a very steep climb. It seems such a cruel joke for the mountain to play. My legs are rubber now. The trail up to the hut is loose gravel. With every two steps I take, I slide back down one. I am losing control of my legs. Putting one foot in front of the other is a chore. I slowly gain ground and finally make my way to the top. As I stand here on the German-Austrian border a feeling of warm accomplishment comes from the thin cold air that surrounds me. I am on top of the world. I have conquered the mountain, even though it stands ready to be conquered once more. “Auf Den Hütten Und Gipfel Fertig Los/Meiler Huette 2.374 M/IMG_9495.” Bergkatze. Accessed March 10, 2017. https://bergkatze.de/bilder/Meiler%20Huette%202.374%20m/slides/IMG_9495.html. “Royal House on the Schachen.” Deviant Art. Accessed March 10, 2017. http://pingallery.deviantart.com/art/Royal-House-on-the-Schachen-300312709. Wilderness Adventure: Am I Fit Enough?